Three years after his death, interest in chess genius Bobby Fischer shows no sign of waning, with a new documentary film about to have its UK premiere. So what is it about the controversial and eccentric chess star that fascinates, asks David Edmonds, co-author of Bobby Fischer Goes To War. It's difficult, now, to imagine the excitement generated by the 1972 world chess title match in Iceland between the Russian champion, Boris Spassky, and the American challenger, Bobby Fischer. What can explain this phenomenon? Why did a cerebral board game suddenly become all the rage? And why, half a century after first coming to prominence, does Bobby Fischer still exert such a hold on the public imagination. And it's too easy to overlook the appeal of the chess itself. It's no exaggeration to say that Fischer was one of the greatest chess players in history. He had a delightfully clean and direct, style - its beauty lay in its relentless efficiency. He calculated at extraordinary speed, but neither sought, nor shied away from complications. Always, he fought to win, whether with the white or the black pieces. En route to challenge Spassky, the Fischer juggernaut seemed unstoppable and he accomplished the unthinkable - winning 20 games in a row against elite grandmaster opposition. Soon after Fischer was crowned world champion, he became a virtual recluse, vanishing from view, and failing to defend his title against the young Soviet, Anatoly Karpov in 1975. 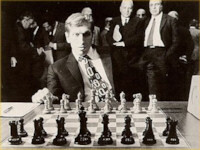 The film documentary "Bobby Fischer Against the World" is due to be released in the UK on July 15th. Read more from the BBC .